Sean Slay is an Ann Arbor native who attended Haisley Elementary School, Forsythe Middle School and Pioneer High School. He graduated from Eastern Michigan University in 1996, and earned his master’s degree in Educational Studies and Teaching Certification in 2011 from the University of Michigan. This is his fifth year teaching fifth grade at Carpenter Elementary School. 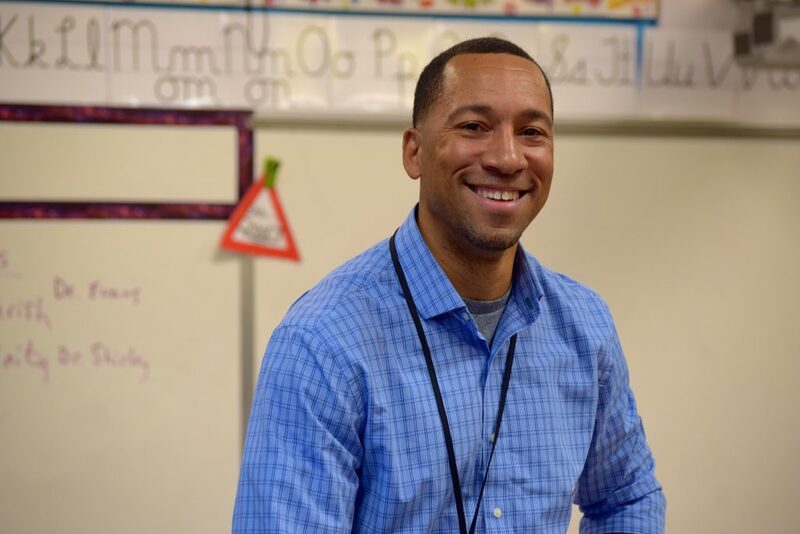 Prior to becoming a certified teacher, he worked in an administrative position, coordinating services for children and families for Washtenaw County Head Start for six years. 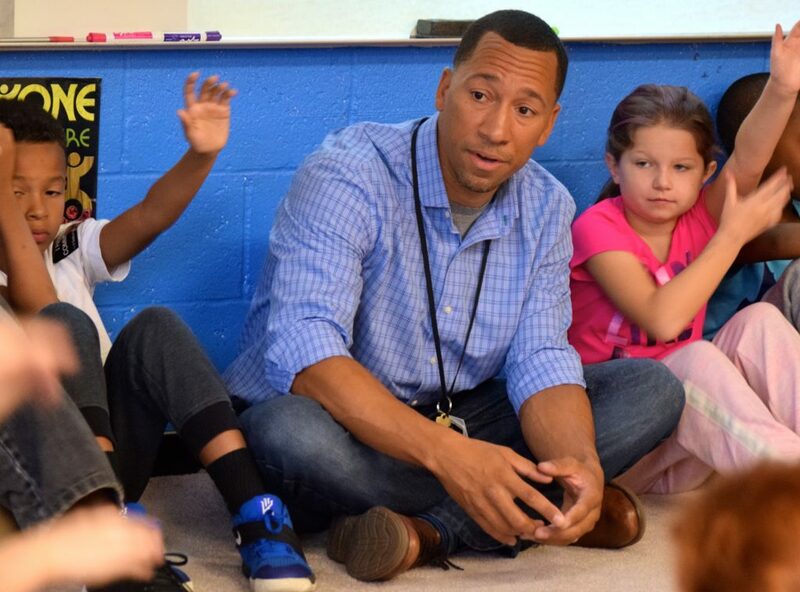 He also served for eight years as a youth outreach coordinator for the city of Ann Arbor, supervising and implementing educational/recreational programs and camps for youth ages three to 18. Slay lives in Ypsilanti Township just a few miles from Carpenter with his wife of 12 years and their two children, who are seven and three. They share their home with 15 African Chiclids, which are exotic, colorful fresh water fish from lakes Victoria, Malawi and Tanganyika in East Africa. Breeding these fish is a great hobby. In addition to breeding and raising his pet fish, Slay enjoys landscaping, completing home improvement projects and spending time with his family. What inspired you to become a teacher? There are many people and things that inspired me to become a teacher. I’ve always been excited about sharing ideas and learning new things. As a teacher, every day I not only teach, but I learn as well. Children have always fascinated me with their curiosity, wonder and the promise that each student has to become someone to build their community, and perhaps even change the world. Knowing that every day I have the opportunity to inspire and encourage young people to do great things excites me. There’s no greater responsibility or an amazingly awesome feeling than being instrumental in helping a child reach his or her full potential, in and beyond the classroom. Describe an average workday. An average workday for me begins with dropping my son off at pre-school at 7:4 5a.m. When I arrive at Carpenter, I check on students serving on safety patrol. After the first bell, my class meets for CPR (Circle of Power and Respect), very similar to morning meeting. Every day our class begins with every student hearing their name and being greeted. Our academic day consists of mini lessons, cross-curricular activities and smaller groups in core areas of math, literacy, science and social studies. Every day I intentionally connect with each one of my students individually. I want them to know that I notice them and see who they are. I make sure that they know that I have high expectations for them, that I believe in them, and I support them in every way. What’s the most important thing you’ve learned about teaching? About learning? The most important thing that I’ve learned about teaching is that no matter how large of a positive impact teachers have on children, we can learn so much from our students. Through teaching, children have taught me that there is much reason to be hopeful and optimistic about our future. How do you stay organized? I stay organized by placing reminders on my calendar, but also by using more traditional ways, such as filing student records. Finally, a good night’s rest helps me to stay focused and organized the next day. What is the most rewarding part of teaching? A rewarding part of teaching is knowing that I’ve played a role in setting my students on a path to be successful, not only academically, but equally important, in demonstrating social graces. To me, this pertains to perceiving themselves in a positive way, and respecting all people and cultures. When my past students return to my classroom to thank me for helping them make Academic Society and Honor Roll, it’s one of those great “lump in your throat” moments as a teacher. Above all, the most rewarding part of teaching is knowing that I’ve built a life-long relationship with my students and families that extends well beyond fifth grade. What was your own experience like in fifth grade? My fifth grade experience was positive. I had many friends that I remain friends with today, over 30 years later. Where do you picture yourself in five years? In five years I picture myself in an administrative position. I look forward to the point in my career where I will be able to positively impact an entire learning community by supporting students, teachers and upholding district policies and initiatives. 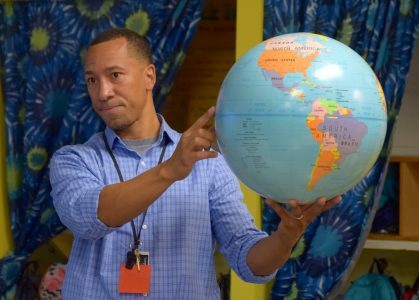 Who was your favorite teacher, and why? My favorite teacher was my twelfth grade Health and Driver Education teacher, Mr. Fred Karr. Hands down. There were many reasons that he was my favorite, but simply stated, he believed in us, no matter what. He loved teaching. He loved his students. Today Mr. Karr volunteers in my classroom providing enrichment activities to my students. His wisdom and positive energy are infectious. He still inspires me today. What has surprised you most about the profession? What surprised me most about teaching is the support and gratitude received from parents and families. I had no idea how much families support Ann Arbor teachers until I began working at Carpenter. Carpenter families are amazing! I’m sure teachers at other schools in our district share the same sentiment about their families. What do you wish everyone realized about the work of a teacher? I wish that everyone realized how important the work of a highly effective teacher is to every student. Highly effective teachers have the opportunity every day to direct students to form positive habits and shape students’ perception of learning. We have not only the ability, but responsibility to do our part to create moments to help children build a positive self-image of themselves. Teachers can ignite the love of learning in every child that lasts a lifetime. If you could change one thing about public education, what would it be? If there was one thing that I would change a bout public education it would be an increased amount of funding that schools receive per student. I believe that every student in every school should have access to plenty of resources that would support their learning through STEAM activities and through the use of technology, at school and at home, regardless of families socio-economic status. What would you tell a college student considering becoming a teacher? Do it! There’s no greater profession. What do you like to do when you’re not working? When I’m not working I enjoy “tinkering” on the piano (I’m not good enough to say I play). I also enjoy working outside in my yard and detailing my 1990 Buick Riviera. Most of all, I enjoy hanging out and doing anything that includes my wife and two children. We salute Mr. Slay for being an outstanding leader in our school and community! Sean Slay is an amazing example of a good person doing greater things. I wish we could bottle his experience, enthusiasm and thoughtfulness and sell it to every school district in the country. This is a well deserved recognition! Mr. Slay is truly a wonderful teacher! Wonderful story. Sean comes from beautiful parents Charles and Louanna Slay. Watched him developed into a fine young man. We need more like him. Sean is an awesome person I been around him all of his life plus he is family so very proud Sean of you. Congratulations Sean, it is refreshing to read about you and your love for your profession. I can only regret that you plan to leave the classroom in five years. Great teachers are hard to find. Your presence as a male teacher at the elementary classroom is priceless. Good luck in all you endeavor. Thank you Mr. Slay, my granddaughter only had positive things to say about you. She was always singing your praises. My prayer are with you. What better person deserves this recognition!!! Keep up the terrific work Uncle Sean!!! We need more Sean Slay in the AAPS community! Loved all your answers…could hear your passion for the profession. I only hope that when you do step into administration to always remember your roots as a teacher, and what drives you, as well as being a positive role model to many students. Duly deserved recognition!